We often assume that Charles Darwin announced a new era in the scientific understanding of the natural world with the publication of On the Origin of Species (1859). In fact, Darwin’s theory was the culmination of decades of speculation about connections between human beings and nonhuman “nature.” In addition, Darwin provided a systematic explanation for ideas that had been developing over several centuries. These ideas were reflected not only in the work of natural scientists, philosophers, and theologians, but also in the images and ideas of poets, novelists, and visual artists. Nature writers, for example, drew on complex and conflicting definitions of “nature” in order to describe their experience of the nonhuman world. Likewise, “scientists” regularly employed poetic or religious terms to present their empirical and speculative findings. Recent scholarly interest in “Romantic ecology” suggests links between our own historical moment and the scientific culture of the Romantic era. A specifically Romantic natural history reveals important connections between “romantic” thinking in science and the arts. In addition, such an emphasis helps us to understand our own assumptions about the relationship between human nature and the rest of nature, our contemporary “green” sense of the ecological interdependence of all living and nonliving things. The World Wide Web (WWW) seems to be the appropriate technology for this purpose, as Shelley’s quote (above) suggested almost 200 years ago (“Nature’s vast . . . web“). The philosophical premise of this site is that there is no “nature” in the classical, or perhaps–more accurately–in the “Romantic” sense; there are only living things and nonliving things existing with various forms of connectedness, and even that boundary–between living and nonliving–is much more slippery than scientists and especially laypeople have imagined over the past two centuries. The goal of this hypertext-site is thus to reveal these connections, not a unified object (or even a unified abstract idea: “the natural”) born out of these connections. The importance of these connections, between poetry and science, between artists and scientists, between plants and animals, between “life” and “nonlife,” between nature and culture–and the importance of collapsing these oppositions–is perhaps best revealed in hyperspace, a space which is somehow less permanent than texts or other physical objects of thought (writing, drawing, sculpture), since hyperspace is composed of digitized bits of data in an energy field. This “field” of connections is actually what we are engaging when we read a website, when we search the World Wide Web, or when we cut and paste from the Internet. This same critique of physicality also applies to ideas, to those groups of thoughts that hang together with specific names: history, nature, Romantic. So natural history is not really a history, nor is it natural, and Romantic natural history is just as anti-Romantic as it is Romantic. These are the sorts of truths that will hopefully be revealed by continued work with a website like this one. A chart and image like this--from almost a decade before Darwin's "On the Origin of Species"--suggests precisely the relationships that Darwin would explain in detail. Every creature with a tail has a tail because it has a backbone. Humans share a rib-cage with every mammal, and bird, and fish, and reptile. Each creature that has a face shares characteristics with a common ancestor that produced the "template" of a face: two eyes, two ears, one nose with two nostrils, one mouth full of teeth and one tongue, and a brain-case that could hold the organ whose gradual expansion produced the characteristics of intelligence, and eventually self-awareness, that would lead from a faithful dog, through a self-conscious chimpanzee, to a language-signing gorilla, and eventually to you and me (in the lower right-hand corner of the illustration above). 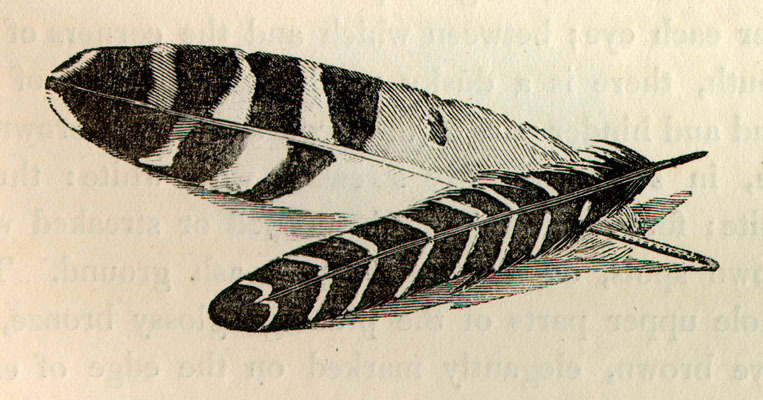 Prints from J. G. Heck, Iconographic Encyclopedia, 1851 (Trans. Spencer Fullerton Baird). 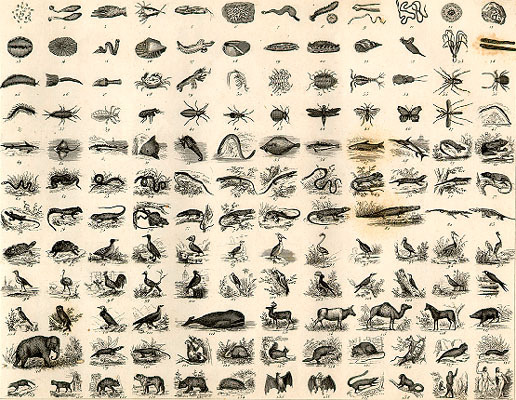 Even in the decades leading up to Darwin’s theory, taxonomy had revealed remarkable relationships among parts of “animate creation” (above) ranging from single-celled organisms (upper left) to male and female humans (lower right). A taxonomic image like this one implied the precise evolutionary relationships that would soon be established by Darwin’s research and increased attention to the fossil record. From unicellular to multicellular, water-dwelling to land-living, legless to legged, finless to finned, wingless to winged: the anatomy of ongoing creation established absolute evidence for shared and common ancestries, genetic and chromosomal commonality, hereditary relationships that would soon explain the unitary and singular family of all living things. In addition, observations by natural historians made it necessary to decide where humans might “fit” into this remarkably rich and complex system of nature as it appeared by the mid-nineteenth century (below). 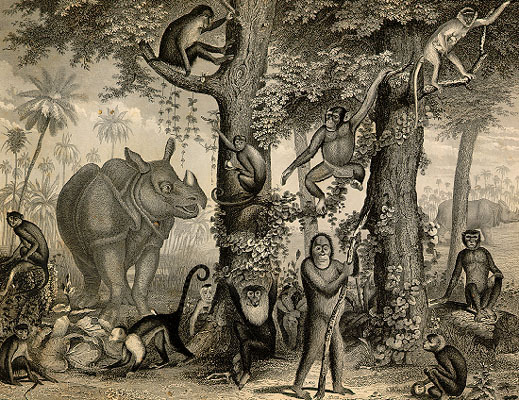 A 19th-century version of the "peaceable kingdom": two rhinoceroses and a variety of monkeys and great apes in a rain-forest scene that suggests the inclusiveness of the pre-Darwinian view of "nature," an inclusiveness that Darwin would soon explain.